UPDATED with clarification from Graeme McDowell: It's not easy to write off Tiger Woods. Like nervous cavemen in one of those 70s dinosaur flicks, pro golfers prod the fallen giant with their spears, not sure if it's really safe to start carving up the carcass. Take Graeme McDowell, who's been pointing out for four years that Woods has lost his intimidation factor and while he still won't declare the king dead, saying that he's "lost that sort of force field of invincibility around him" is probably as close as you can get. No-one gained more than McDowell when Woods hit that fire hydrant on Thanksgiving Day 2009. He replaced the 14-time winner in the Chevron World Challenge at Thousand Oaks just days later, finished second to Jim Furyk and earned enough world ranking points to finish the year inside the world's top 50, clinching his place in the Masters and the US Open. The rest is history. He won the US Open, came back to Chevron and beat Woods in a playoff that year and hasn't really looked back since. When he beat Woods in that playoff for the World Challenge in 2010, holing putts from all angles, he hinted for the second time that year that the cracks that were beginning to appear in the famous Woods aura. Now, it seems, he's not holding back any more. In 2010 he said: “I’m definitely a guy who says that golf needs Tiger Woods and we need him back winning tournaments. “I think he can play his way back into having that mystique again. There’s no doubt. He’s just got to do the talking with his golf clubs now. “He used to appear invincible. Of course he’s made himself appear more human in the last 12 months. At the end of the day, we’re all humans and we all make mistakes and we all hit bad golf shots. At the WGC-Bridgestone Invitational a few months earlier, McDowell suggested that Woods' red-shirt was no longer intimidating. "That's his trademark," McDowell said. "Really, I think that's all it is right now. What it means to him is obviously a different thing. What it means to the rest of us ... it's not really something to be intimidated by anymore. Mystique is not something that's measurable It's when you stand on the tee box with him and you get the feeling you're in the presence of greatness. When someone shows themselves as flawed and human ... what Tiger was doing all for years and years was superhuman. He was imposing himself on players just by being there. Until he starts winning again, he's not going to get that back." Still, the Ulsterman is clearly not convinced that we will see the old Woods again. During the same event he told PGA Tour.com's Brian Wacker: “He’s lost that sort of force field of invincibility around him. The aura is not as strong. ...He seems more beatable nowadays simply because the players around him are better and have more belief thanks to Tiger moving the needle. McDowell's matchplay aura is clearly still strong as he helped Europe to a 5-0 whitewash of Asia on the opening day of the EurAsia Cup in Malaysia. Playing with Jamie Donaldson, he helped in a 3 and 1 win over Gaganjeet Bhullar and Nicholas Fung at Glenmarie Golf and Country Club. McDowell, who secured the winning point in Europe’s victory in The 2010 Ryder Cup, tipped his cap to partner Donaldson, who carried the last pairing home after falling 3-down early on. “We somehow managed to make the turn at 1-down which was huge and then this guy (Donaldson) just played phenomenal on the back nine, and I just had to just chill out and hang with him a little bit. It was great to watch,” said McDowell. 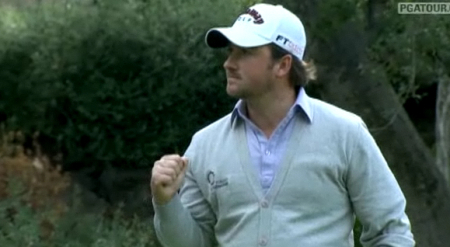 10.40am: Graeme MCDOWELL/Jamie DONALDSON vs Gaganjeet BHULLAR/Nicholas FUNG. Ryder Cup players Paul McGinley and Graeme McDowell hope Tiger Woods does not take too much time out of the game. With sponsorship opportunities thin on the ground and tournaments struggling to maintain their million-dollar prize funds, the Irish duo know that Woods' presence on the fairways is absolutely key. "If he doesn't return, it's a scary vision," McDowell said. "It's a very scary vision. We're under no illusion how prosperous we've been with Tiger Woods playing in our era. There are a lot of global stars on their way up. But they're not quite ready to replace Tiger." McDowell on Tiger - "I have never seen him so nervous and so down and depressed about things"
Graeme McDowell believes a “humbled” Tiger Woods will be a changed man when he eventually returns to the game. Speaking on Sky Sports News just minutes after Woods’ appearance at TPC Sawgrass, the European Ryder Cup star said: “He seemed very humbled by everything when he came out. I have never seen him so nervous and so down and depressed about things. I guess he had a lot of time to think about things and had a lot of regrets. 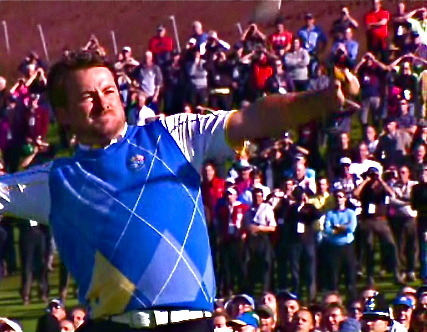 Graeme McDowell was a rock in the Ryder Cup - not just for Europe but for rookie Rory McIlroy. McIlroy, 21, suffered a blow to his confidence when he became a target for Tiger Woods by declaring that every member of the European team would fancy their chances of beating the world No 1. But McDowell, 31, played the big brother role and eased McIlroy’s fears by sitting up with his young friend for a late night chat that helped the Holywood starlet deal with the pressure. World No 5 Graeme McDowell insists he’s not in the least but fazed by being drawn with fallen idol Tiger Woods for the first two rounds at Augusta. G-Mac shrugs off Tiger-gate with a smile: "I really shouldn't talk so much"
Graeme McDowell admits that the backlash he received from fans on Twitter was the reason for his decision to clarify his recent comments on Tiger Woods.